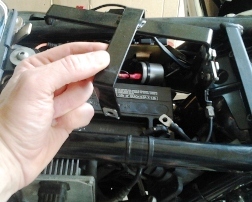 The purpose of this article is to show how I replaced the original Yuasa YTX20-BS battery in my 2007 Moto Guzzi California Vintage. This was an easy maintenance task, but like many things, requires dome time and care. If you like doing your own motorcycle maintenance, then this will be an easy one to try. The only tools I needed were two metric hex wrenches, a screwdriver, and a battery charger. 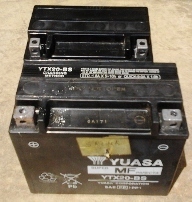 The original Yuasa battery, serial number 6A171 (I think was from 2006), has finally come to the end of the road. As you may have read in my earlier posts, I have been using a Battery Tender Junior ever since having some weak battery issues long ago when I was using the stock 55 Watt auxiliary lights. Replacing 55 Watt bulbs with the 35 Watt versions really helped and still provided plenty of lighting. For 6 years of riding and almost 18,000 miles, the Tender has helped me keep the stock battery going. Now for the first time ever, I had to bump start my Guzzi to when I got on it to leave after a day at work. It has been decades since I had to bump start a motorcycle, but always parking near the upper end of the hill paid off for me this day. I learned that second gear worked much better than third for my Cali. 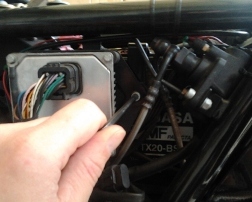 To remove the battery on a Moto Guzzi California like mine, it is pretty simple to do. First, remove the seat via the key lock on the left side of the bike. Second, remove the left side cover via the 2 large head hex socket screws that hold it on. Third, disconnect the cables from the battery terminals and be careful not to touch anything against those terminals. I took a picture of my battery before I undid the cables. I looked at that to make sure I got everything reconnected correctly later. You might want to do the same. Nest, I removed the single hex socket screw on the left side of the battery area that secures the battery hold-down bracket to the frame. With that screw removed, I lifted the hold-down bracket out and set it aside. It has some rubber pieces glued to it, so make sure you don’t lose those if you try this yourself. Mine stayed on the bracket as they should, but it isn’t hard for me to image some of that peeling off. With the battery hold-down bracket out and the cables disconnected, the next thing I did was to grab the battery and lift it out. I had to laugh at the piece of masking tape that I found on the side my battery. The dealer had written “Skunk” on it, probably to help him remember which battery went with which bike when he was first preparing it for sale. I remembered his mechanic used to refer to my bike as the Skunk bike, obviously due to the back with white stripes color scheme of this Vintage. 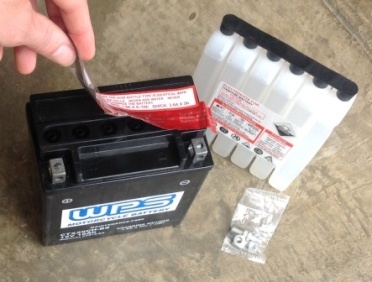 After considering a variety of battery brands and battery technologies, I settled on a what is supposed to be a stock AGM equivalent replacement battery from Western Power Sports (WPS), model CTX20CH-BS. My main motivation was to save a few bucks versus the Yuasa brand. Time will tell whether or not it was worth it, so I guess you’ll need to stay tuned for that. Because I don’t have a lot of extra time, it was easiest for me to order my new battery online. I planned to do the work myself anyway. Shipping was free, and I did not have to pay sales tax. That “sealed” the battery deal for me, pun intended. Something you need to know about ordering a battery online is that you normally have to add the acid and charge it your self. I realize this is not something everyone wants to do, but I actually found it very easy. The acid comes nicely packaged with the battery in a special plastic bottle. No measuring, no fuss, very simple. Actually, it is a co-joined series of 6 bottles, each with a little foil seal. It reminded me a lot of those little wax juice bottles I used to get as a kid, except that this has sulfuric acid in it, not colored sugar water. 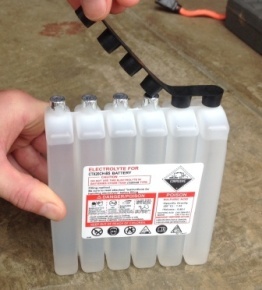 The battery will become a sealed battery after you fill the acid and push on the caps. No water is involved. Once filled and sealed, you never are supposed to open it again, and never are supposed to add water. The filling of the acid was extremely easy thanks to the design of the battery filler holes and the seals on the bottle. The battery cells have angled hollow tubes that stick up so that you simply position the acid pack upside down on top of then and push down firmly to pierce the seals all at once. The acid then slowly drains from the bottle to the battery. The instructions said to let it drain for about 20 minutes into the battery before removing the bottle. Once filled, you just push the black plastic cap onto the filler holes to seal it. Next step was to put it on the charger. The instructions were a little confusing regarding time and how many amps to use for that. The instruction booklet said 1 amp, but the sticker on the battery said 1.8 amps. My Battery Tender Junior is rated 0.75 Watt, but my regular battery charger has a 12 volt setting for 2 amps, so that is what I used. 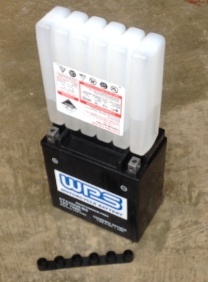 Something I was surprised about was that the new WPS battery is obviously smaller than the old Yuasa battery. It has the same 18 amp-hour rating. The Yuasa YTX20-BS is rated 270 cold cranking amps, and so is the WPS CTX20CH-BS. Again, time will tell, but maybe this new battery saved me a few pounds of weight as well as about $15 to $20 cost. 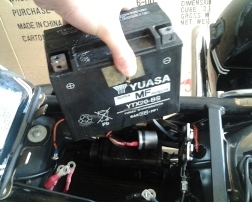 Yuasa is a very good brand in my opinion, and I think they are the industry leading brand of OEM motorcycle battery. 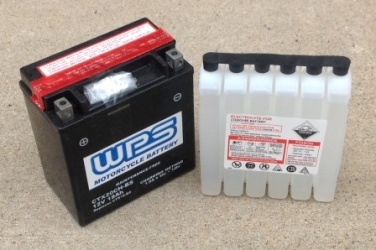 If I have any luck, my new WPS battery will help power me through another 5 or 6 years of Moto Guzzi California riding enjoyment. John rides and maintains a 2007 Moto Guzzi California Vintage motorcyle. He and his family reside in North Carolina, allowing him to enjoy riding year-round. John is a mechanical engineer, a graduate of the MSF Experienced Rider Course, and participates charity events with his motorcycle. 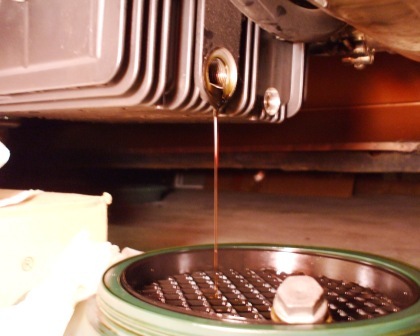 Moto Guzzi California sump pan removal isn’t difficult for doing an oil change. Here I show how to change the oil and oil filter on a Moto Guzzi 1064 cc v-twin engine. The original battery spec for 2001 EV is 30Ah, not sure why they used that, but that is also what is listed in the owners manual. I use a battery tender on my 2007 when I don’t use it for a while and I always run my auxiliary lights (35W bulbs). Happy to report no problems for me with 18Ah battery. Interestingly, my 2001 California EV80 is fitted with a 30Ah battery as stock! It’s interesting that the later CalVin is only 18Ah…which seems more realistic as 30Ah is more than my car….Guzzi must have wizened up at some point and thought “we can save some money by not overspeccing the battery size”. Which I agree with. It’s massive and weighs the same as a ship’s anchor. I’m going to try a 18Ah. I followed your advice and did exactly the same procedure; running fine. Thanks for the write-up. I recently inherited a ’90 Cali III. It needed a new battery so I used a DieHard tractor battery – $50 from Sears. However, looking at the size of the Yuasa is making me re-consider my next battery. The size of the DieHard made it a tough, tight fit installing it under the seat.